Snakes! Where? Everywhere! But don’t panic, because they’re mostly harmless. As 2013 is the year of the snake, KS slithers a little closer to the truth about our reptile friends. Of all the wildlife in the world, snakes are by no means the cutest or cuddliest. Indeed these scaly, legless animals often invoke sheer terror into the hearts of otherwise nature-loving folk. But snakes are a unique, fascinating, and dare I say beautiful group of animals, of which a great variety of species can be found right here in Kansai. Snakes are cold-blooded limbless reptiles, lacking eyelids or external ears, with incredible multi-jointed jaws enabling them to swallow prey many times larger than their head. They can range in size from the 10 centimetre long thread snake to the nearly seven-metre giant reticulated python of Southeast Asia. All snakes are predators, but most species are in fact non-venomous. Having been around for more than 100 million years, they’ve adapted to live in a whole range of environments from deserts and jungles, to the highest mountains and even the oceans. There are over 40 species of snakes in Japan, and a good number of these can be found almost on your doorstep. But don’t panic! Snakes are shy animals that avoid people whenever they can, and contrary to popular belief, most are completely harmless (to humans) and reluctant to bite unless as a last resort. Due to their secretive nature, spotting snakes out in the wild can be a challenge, and often involves a bit of luck more than anything else. Perhaps the most well-known, although still often misunderstood species, is the mamushi, a small greyish brown pit-viper. Adults are typically between 45 to 65 cm long, with a series of dark brown blotches running down the back, and have the triangular head shape typical of all pit vipers. Because they mainly feed on frogs, they are usually found on forested hillsides close to a water source or around rice paddies. The mamushi is not aggressive, and when approached by humans it tends to stay still, relying on its camouflage to hide. Unfortunately this means that it is sometimes inadvertently stepped on, and this is when bites occur. Along with the habu of Okinawa, the mamushi is considered to be one of the most venomous snakes in Japan, and a number of fatalities are recorded every year. But a good antivenin is available, so medical assistance should always be sought if you’re the unlucky victim. One of the largest snakes in Japan, the Japanese green rat snake (aodaisho) can grow to two metres long. It is dark olive green with small dark blotches, and sometimes has dark rudimentary stripes running down its back. It lives in forest clearings, fields, rice paddies, and can often be found close to human settlements. It is not venomous, but is a strong constrictor, wrapping its body around its prey and squeezing until the unfortunate creature is subdued. This snake eats mostly rodents (hence the name ‘rat snake’), but can also climb trees to take birds and their eggs. A little shorter than the Japanese green rat snake, but often confused due to their similar appearance, the Japanese four-lined rat snake (shimahebi) has four much more distinct dark stripes running along its body. This very fast-moving species prefers sunny locations often close to water, where it hunts a variety of prey including frogs, small mammals, birds and eggs. This snake is also completely harmless to humans. The red-sided water snake (yamakagashi) is a medium-sized serpent, although females can sometimes grow as long as 150 cm. It is usually blackish or green with a pattern of dark blotches on its back, but this can vary tremendously, and in the Kansai area most individuals are light brown, with pink or red blotches on their sides. 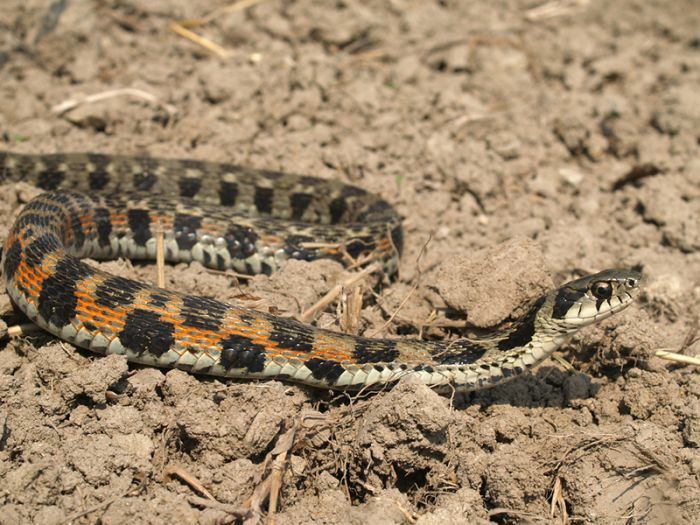 This snake is common in rice paddies, feeding mainly on frogs, tadpoles and fish. Due to its very peaceful nature and reluctance to bite, this species was once considered non-venomous, but we now know it has fairly potent venom, although fortunately accidents are very rare. The hibakari or ‘one-day snake’ is a small and slender brown coloured reptile, with almost no pattern on its scales. It is often found on the edges of rice paddies, where it slithers with its head held above the ground, seemingly scanning its surrounds. Its prey includes frogs, tadpoles and earthworms, and it is usually active in the cooler parts of the day, such as the early morning and at dusk. The name ‘one-day snake’ seems to come from the old belief that if bitten, the victim has only one day to live. In fact, this snake has no venom and is completely harmless to humans, but perhaps was sometimes mistaken for the previously mentioned red-sided water snake, which in Kansai can also be uniformly brown in appearance. Of course being cold-blooded, all these snakes are currently sleeping through the long, cold winter. But come early spring they will emerge to eat and breed. So when the weather gets warmer in a few months’ time, and you’re out on a secluded mountain trail or passing by an old rice paddy, stop for a moment, tread lightly, and you may get a glimpse of one of our secretive serpentine friends.